When you think about it, we invest so much time, effort and money into our hair. It’s crazy. I’ve spent over half my life getting my hair cut and coloured into various shapes, styles and shades at a dozen different salons. For the last 6 years, my hair was entrusted into the capable hands of Joe Mehmet and his team at Joe’s Salon. Under Joe’s guidance, my hair has had balayage, pink extensions, been dyed blonde and back to brown while my hair grew to waist length and was chopped into a shoulder grazing bob. There’s not much that we didn’t try out. Sadly, Joe and his wife Rex retired from the hairdressing game earlier this year. Distraught is an accurate description of my reaction, but I couldn’t be happier for them and the next chapter in their lives. While Joe’s Salon is still open under new management, I knew it wouldn’t feel right heading down to the salon on Sloane Avenue and not be greeted by Joe and Rex. The place is still the same, the staff are still the same but for me, it just wouldn’t be right. Aside from the expert hair care, the thing I loved most about Joe’s was that it felt like home. I’d always end up staying for a while after my appointment was done, either half an hour or a couple of hours. It’s safe to say the bar was set high, but I knew just the guy to trust my hair to. Enter Adam Bennett. I first met Adam Bennet years ago at an event at a salon in Covent Garden. This was during the blonde years. Adam was in charge of giving me a gorgeous Great Gatsby-inspired hair style and created the most incredible braided updo I’ve ever seen. We really hit it off and kept in touch via social media, as you do. Adam is what I would call a hair genius. His approach to hair is almost scientific, as he’s as experienced in Japanese precision cutting as he is Italian freehand. His consultations feel like an actual consultation, rather than just asking ‘What do you fancy today?’ he assesses your hair type and lifestyle to make sure you have the dream cut. I recently visited Adam in his salon at W hotel, nested in a private suite in the AWAY Spa. The space itself is bright white, beautiful and a little sanctuary just a hop, skip and jump away from Leicester Square. Adam started my consultation with an assessment of my current hair colour. 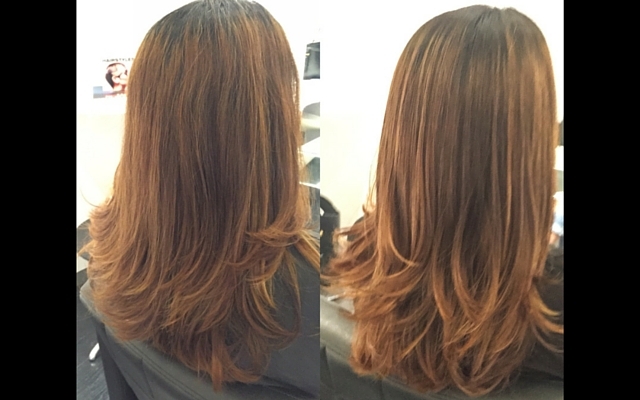 He really liked the existing colour but just wanted to tweak the tones and break up the colour with some lighter slices – just pulling it all together. I was very happy with this so Adam started work, while we chatted away about everything from mutual friends to Beyonce. When Adam had finished the colour and given me a bouncy blowdry, I saw exactly what he meant by ‘pulling it all together’. The colour wasn’t dissimilar to the colour I walked in with, which I actually quite liked. It just felt more refined and polish. I couldn’t point out exactly what Adam had changed but I knew he did something; it was just more expensive looking. I couldn’t be more thrilled with the colour and I’m already looking forward to building on the colour next time. Adam’s salon is based in the AWAY Spa at W London.